Our Duplex 2205 Stainless Steel is a nitrogen-enhanced duplex used in applications requiring high strength and excellent corrosion resistance. It is designed to combine improved resistance to stress corrosion cracking, pitting and crevice corrosion. Duplex 2205 provides nearly double the corrosion resistance typical in other austenitic stainless steels. Best Stainless supplies Duplex 2205 SS for a variety of industries including oil & gas, petrochemical, marine and pulp & page factories. 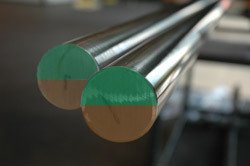 Best stainless also offers Duplex 2507.